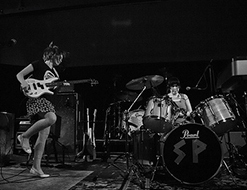 The teenaged sisters in Skating Polly spend most of their time on Fuzz Steilacoom, their third album, making a wonderfully unholy racket: overdriven bass, pounding drums, six-string screech and half-chanted vocals. It’s the sound of punk; more than that, it’s the sound of youth, and unchecked urgency, and desires too fierce to be fettered. So fun is Fuzz Steilacoom that it’s sometimes easy to forget what skilled, accomplished songwriters Kelli Mayo (14 years old) and Peyton Bighorse (19) have already become. “A Little Late”, the final track on the incendiary set, leaves nothing in question. The song features little more than piano, a straightforward drumbeat, and the duo’s striking voices in harmony and counterpoint. The song, which builds from a plaintive verse to an emotionally bare chorus, is both endearing and enveloping, and needs no decoration or effrontery to make an impression. “A Little Late” is a perfect counterpoint to “Alabama Movies,” the raucous, catchy lead single from Fuzz Steilacoom that won plaudits for its punk-rock energy. The two singles bookend the set, and establish Skating Polly as the rare young act with ideas to burn, and plenty to express. Ever since the pair first picked up instruments, Skating Polly has been acquiring fans — some of them world-famous in their own rights. Exene Cervenka of X, for instance, recognized Kelli Mayo and Peyton Bighorse as carriers of the punk rock flame, and became an early adopter, a champion of the act, and an occasional producer. Lori Barbero of Babes in Toyland, a clear inspiration for the sisters, is another supporter. The Flaming Lips and Band of Horses took Skating Polly out on the road with them, and the act has also opened shows for Wavves, Mike Watt, and the Pains of Being Pure at Heart. Another high-profile supporter — British rocker Kate Nash — makes an appearance in the beautifully-shot clip for “A Little Late. As Kellie Mayo and Peyton Bighorse sing together on the sidewalk of a suburban street, Nash puts her arms around the sisters and joins in on the chorus. The “A Little Late” video was directed by Dave Smith, who worked with Skating Polly on the clip for “Blue Obvious”, the fuzzed-out single from the 2013 album Lost Wonderfuls. There, Smith used his camera as a blunt instrument; here, he takes a gentler approach, capturing the sisters side by side on a piano bench. Their interaction is sweet, and absolutely genuine, and it’s more spellbinding than any special effect could ever be. For more info e-mail info@HIPVideoPromo.com . You can also visit www.SkatingPolly.com.